This is another shot from the borrowed Yashicamat. 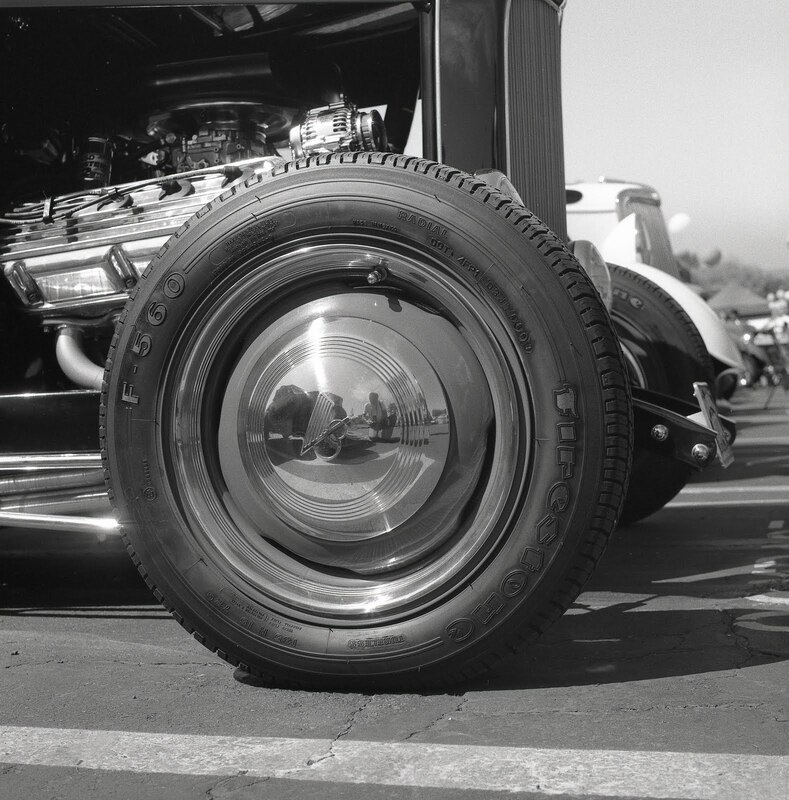 This is the right front wheel of a Ford hot rod, done up '50s style with a flathead V8, no sides on the hood, really cool. It was at a car show in Thousand Oaks, a few miles from my house on a really nice day in February. The Yashicamat is a 120/220 film camera. This means that there are two kinds of film that it can use, 120 film and 220 film. The fact is, these film stocks are really very similar. There are no sprocket holes on 120 or 220 film. The film is wound through the camera by tension from the wind side. 120 film has a paper backing and it is long enough for 12 exposures in the square 6cm x 6cm frame. 220 film has NO paper backing and it is long enough for 24 exposures. The paper backing is a relic from the times where cameras had a little red plastic window in the back that the frame number could be read through. The frame numbers are printed on that paper backing. Clearly, a window to the outside would be a bad thing to run film past, so the paper prevents light from getting to the film. There are no modern (and by that I mean post 1930 or so) cameras which have those windows, but the paper remains for backward compatibility. Backwards 80 years. Software companies could learn a thing or two here. Also, the Yashicamat is a TLR camera. Twin Lens Reflex. There are two lenses. One for the viewfinder, one for the film. The viewfinder is on top and you look down into it. What I didn't notice when I took this shot but noticed pretty quickly when I saw the negative was that I am reflected in the hub cap. I'm looking down, into the finder of the Yashicamat. I'm crouched down so that the camera is roughly at the level of the center of the hubcap. I've carefully focused on the cap, metered and adjusted aperture for correct exposure and I'm gently pressing the shutter oh.. so...slowly. Because it is a TLR there is no mirror to go slamming up and then back down. There is just the gentle little 'snick' of the shutter opening, then closing. It is very, very quiet. The lens on this camera has a maximum aperture of 3.5, which means it is not particularly fast for a modern lens but it happens to be extremely sharp. Combine that with the real estate of a medium format negative which is equal to four 35mm negatives and you get a really really sharp photo. I really do enjoy looking at them.